Oh wait, you can do that? Like in most Brazilian steakhouses, they cook their picanha on a spit over a fire until the beginning layer is done. Then they slice, serve and place the skewer back on the fire to keep cooking. This is a traditional way of keeping the meat hot and juicy but also perfectly cooked! Give your friends a crazy cool treat by cooking the picanha until the first inch is perfect. Slice it off onto their plate and give them a side of Chimichurri. That is an experience you will never forget. Or, you can cook the whole Rotisserie Picanha and serve it classically. 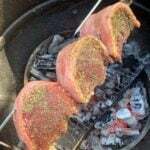 Just make sure to have the meat rest completely before serving, and that you gauge the temperature at the thickest part of the meat that is away from the skewer. Otherwise it will mess up your temperature gauge reading. 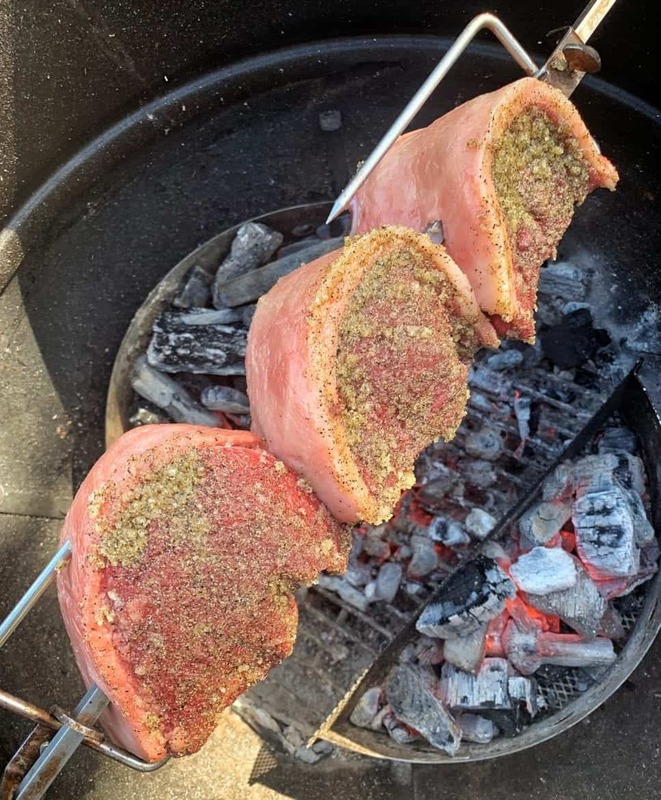 Either way, just make sure to have clean and natural lump charcoal like Cowboy Charcoal when you are cooking this Rotisserie Picanha. You want the outside layer to be delicious and smoky. Enjoy! 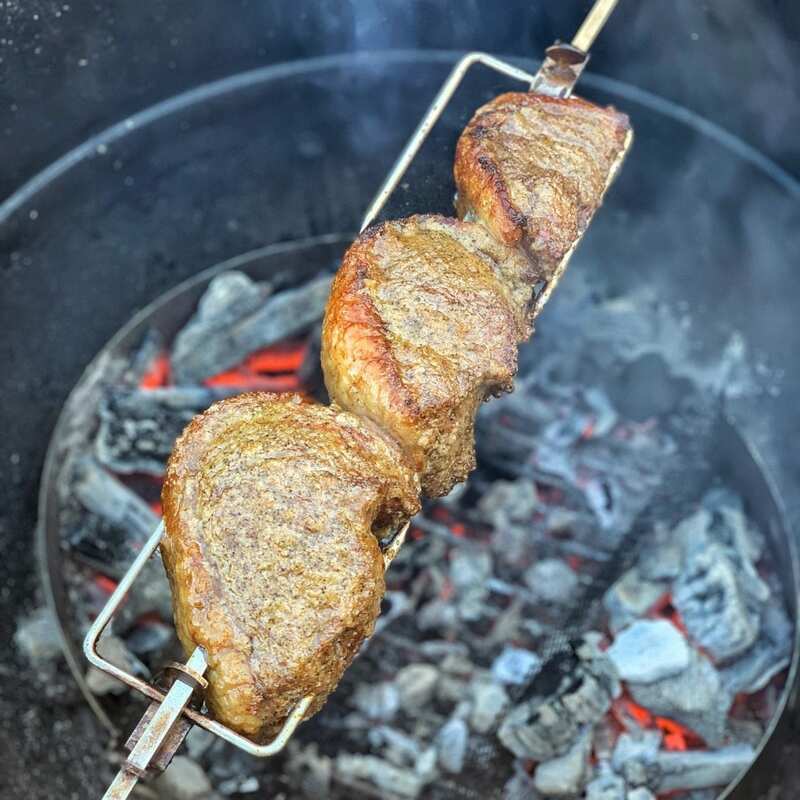 Learn the art of cooking picanha over the fire on a spit with this recipe. Delicious and smoky Rotisserie Picanha with a little bit of chimichurri. Use some Cowboy Southern Style Hardwood Lump Charcoal to light fire and let burn for 10-15 minutes. Once Charcoal is white hot, push into one or two piles for indirect grilling. On your rotisserie skewer, make picanha into a “C” shape and secure onto skewer. Lather with olive oil and season using all the seasonings above. Place skewer over the fire, turn on rotisserie and cook for 30-40 minutes or until the internal temperature is 125F. *Tip* If you want to cook quicker, pull skewer off grill and slice the outside layer to serve. Place the skewer back on the grill to let cook until done again. Let meat rest for 8 minutes, slice and serve with Chimichurri! Equipment: Cowboy Charcoal, rotisserie, cutting board and knife.